Carahsoft serves as the master government aggregator for many of its best-of-breed vendors. Carahsoft’s dedicated Solutions divisions proactively market, sell and deliver VMware, Symantec, Dell EMC, Adobe, F5 Networks, Open Source, Micro Focus Government Solutions, SAP, and Intelligence products and services among others. Carahsoft is consistently recognized by its partners as a top revenue producer, and is listed annually among the industry's fastest growing firms by The Washington Post, CRN, Inc., Washington Technology, Washington Business Journal, and SmartCEO. To simplify procurement, Carahsoft has secured numerous contract vehicles, including agency-specific and government-wide federal, state, and local contracts. 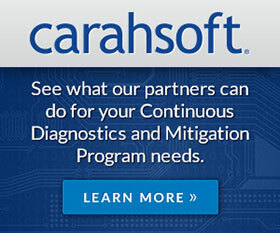 Carahsoft offers the GSA Schedule as a contract vehicle for all our government customers. The E-Government Act of 2002 allows all state and local government agencies to make IT purchases off the GSA Schedule. Click for more information on contract vendors, ordering and terms & conditions. Carahsoft, the Office of Management and Budget (OMB), and the General Services Agency (GSA) have partnered in an agreement that will benefit all of Adobe and HPE’s Federal customers. This was accomplished under the Federal IT Acquisition Reform Act or FITARA by modifying Carahsoft’s IT 70 GSA Schedule, Contract No. GS-35F-0119Y, to incorporate government-wide savings based on the aggregate purchase for all federal agencies. This modification to Carahsoft’s GSA IT Schedule 70 contract directly supports OMB’s Category Management Policies. The total aggregate purchase now provides large-volume discounts, greater discounts will be applied as the aggregate increases. The AWS marketplace provides comprehensive coverage for your products. With its extensive collection of software offerings, your product will be accessible to the end-user faster and in more capacities than before. Carahsoft works hand in hand with the AWS Marketplace team to ensure that our partner and customer needs are met every step of the way. With a large portfolio of products, Carahsoft is able to better serve our AWS customers in a rapidly evolving environment. For more information, please contact AWS@carahsoft.com. Carahosft Technology Corporation awarded categories = PaaS, IaaS and SaaS. The NASA SEWP V Government-Wide Acquisition Contract provides the latest IT products and product-based services to all Federal Agencies. Carahsoft proudly teams with our manufacturer and reseller partners to offer hundreds of best-of-breed solutions addressing key government initiatives through the many contracts in the SEWP V program. This 80-page guide features the latest updates and service highlights from the SEWP PMO, plus information on products available, and the contract holders, including Carahsoft and many of our reseller partners. This FCW guide, titled Evolving with SEWP V, includes insights into the fifth iteration of the program and all that is in store for the upcoming year. Showcasing how the agency continues to listen to its customers and develop new tools and processes to help them meet their IT buying requirements. The information required to process your order is listed below.